Specially designed for biopsy specimens during the embedding process. 0.9mm square openings to insure proper drainage. Not suitable for automated printers. 30° angle. Sold in box of 500. 0.9mm square openings to maximize fluid exchange and to insure proper drainage. 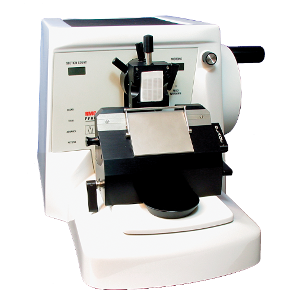 Series 200, manual cutting stroke rotary microtome, basic unit. Includes foot switch control for trim function. Manually operated cutting stroke with balanced hand wheel. Retraction on return stroke.